I always miss three things while traveling abroad: ice, free bathrooms, and good service. Something I never fully appreciated as an American was the excellent service of our restaurants, wait staff, and wine servers. In most European countries, you get your food or wine how they make it—and even if you want to, they will not let you alter it. This fact became very apparent the first time I tried to order ranch dressing to accompany my calzone. CiCi and I had made our way from Vienna, Austria to Siena, Italy in an overnight train. Thankfully, there were no boisterous Aussies fuming up the place. However, the overnight train did not guard against domino-playing Russians smacking the square bones on their service tops. Nonetheless, the train car was still a step up from the Cheap Cheap Homestay, and well worth the time saved. Italy, or Tuscany at least, was much slower paced than Eastern Europe had been. Everyone walked slower, talked slower, and got your food slower. When we arrived in town around 11:00 a.m., we were famished from lack of edible train food. 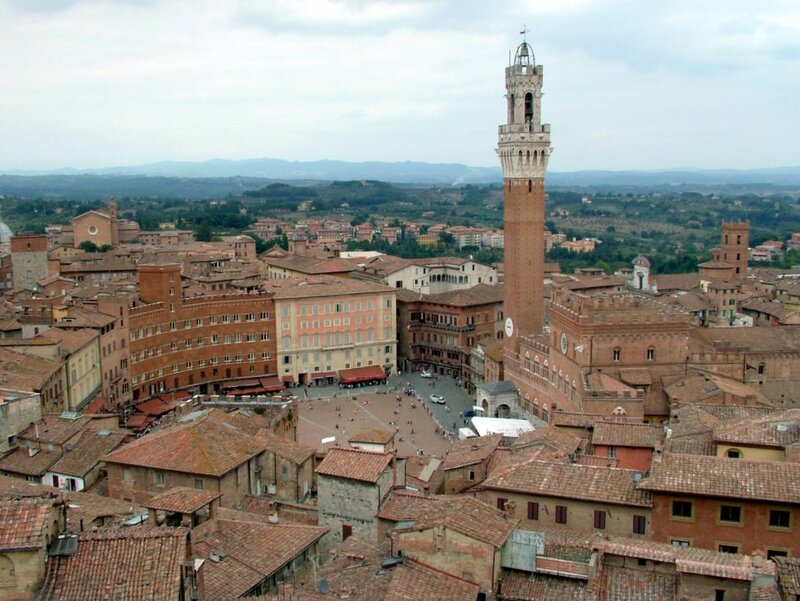 Luckily, the small town of Sienna had a smorgasbord of fine Italian cuisine (and wine). We started at a gelato-pizza joint and ordered two calzones full of cheese, spinach, and sundried tomatoes. Fooled by the Prada and Louis Vuitton stores which were peppered throughout Sienna’s cobblestone streets, I thought we were in a civilized place. That, and I saw a bottle of creamy-looking goodness that resembled ranch dressing. Unfettered, I tried again, pointing to the bottle of white creamy sauce. “RANCH? Can I have? Por Favore?” Again, he reacted shortly. “It is not possible.” Oh no! I thought, he hit me with “it is not possible,” the worst fate of any foreigner traveling through Europe. Once a European utters the words, “It is not possible” it is the Monopoly game equivalent of “Go to jail. Do not pass go. Do not collect $200.” You request has been DENIED. Confused, I looked over at CiCi, who was half way through her calzone, and laughing at me through a full mouth of cheese. “What was that all about?” I asked her. All I wanted was some of the sauce that was sitting right in front of the guy. “It is not possible,” she chuckled and swallowed. “Why not?” I asked. CiCi carefully explained to me that Italians take great pride in both their food and wine. Even the calzone was made with care, and intended to be enjoyed how they prepared it, not how I wanted it. That, and I was asking for tartar sauce the entire time, a combination which apparently grossed out our waiter. As it turns out, Ranch dressing doesn’t exist anywhere but the good ‘ol U.S. of A. After lunch, we decided to scope the town and hunt for lodging. Sienna was like a medieval nights dream. The clay-stone buildings and quaint pathways decorated with colorful awnings were all situated in a semi-circle e around the town square. The town square was centered around a majestic grandfather clock that towered over the village. The fan-shaped pavilion was open for children, performers and picnickers. We meandered around for a bit, popping in and out of stores. Whenever CiCi and I did any kind shopping, we had an unspoken rule: For every two stores we hit, we must stop at a bar for at least one glass of wine. By the end of the day, the ratio changes, and eventually the stores close, leaving us with just the wine and bars. This day was no different. From time to time, we stopped into a hotel to ask about lodging. Everyone looked at us like they had been booked for months, and gave us the death line, “It is not possible.” We had just about resolved to sleep in the town square, as we were finishing up a bottle of “table wine” Chianti at a candle-lit wine bar. The old lady serving us had warmed up to the fact that we were loud Americans, willing to buy a lot of wine, and let us in on the reason we were having the lodging dilemma. The Palio of Siena festival was in town. 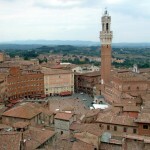 This is Siena’s famous annual horse races that end in the beautiful town square. I had mixed emotions: excited, because festival meant experience, and I loved a new experience. Alternatively, I was frustrated, because finding a place to sleep was going to be impossible. We thanked the old lady, and asked where we should inquire next. She looked up, evaluating whether we were worthy of her advise. Then, she nodded in approval, and said, “Me Brot, he has a vineyard outside the city walls. You want wine, right?” Yes! We wanted wine, but more importantly, we wanted someone who wasn’t a Wine Blonde to teach us about Italian wines.